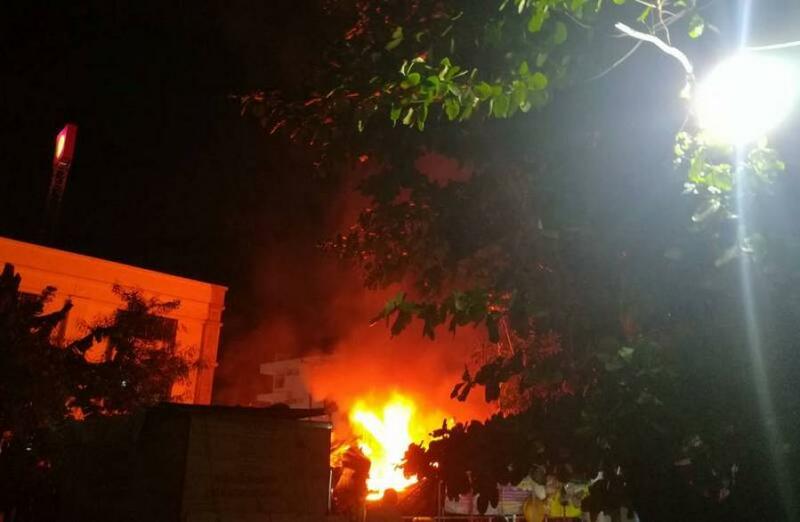 PHUKET: An 87-year-old lady is safe after her Phuket Town house caught fire last night, causing damages estimated at 100,000 baht. The house, which is located near the Government Savings Bank in Talad Yai, caught fire at about 8:20pm. Firefighters from Phuket City Municipality were called in to help. “A total of four fire trucks were at the scene doing their best to douse the flames and prevent them from spreading to nearby buildings. The strong wind made it even harder, but they were able to succeed in about 30 minutes,” said Capt Preecha Khongnu of Phuket City Police. “Somboon Decharat, 87, a former trash collector at Phuket City Municipality, said she lived there alone. She told us she always lights candles and incense at 5pm everyday for prayer and then goes to bed,” he added. Ms Somboon told police that while she was sleeping, she ‘heard someone whisper in her ear’ to leave the house and that she was ‘not allowed’ to stay there anymore. She then called her friend to pick her up and went to stay with her in Rassada. “At this stage, we are trying to identify the cause of the fire. We believe that it may have been caused by the candle or incense, but we will investigate further to find out for sure,” said Col Preecha.